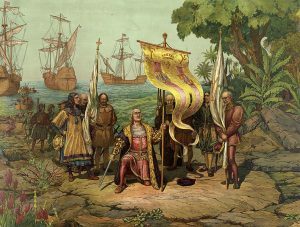 Columbus claiming the "new world"
I probably first heard about the “Doctrine of Discovery” when I came upon my parents during one of their kitchen table sessions. Typically, Dad would make a point by poking a finger at the table. Mom might ponder a moment, maybe leaf through Felix Cohen’s Handbook of Federal Indian Law, or reach for a piece of paper in a large stack of clippings and hand-written notes. Then she might present a counter-point or maybe an entirely new argument. This could go back-and-forth for hours with occasional bathroom breaks or a temporary truce declared for the duration of The Carol Burnett Show. Often, the discussion would centre on familiar questions that usually began with: “By what right… ?” You could fill in the blanks. By what right… did the Government of Canada refuse to acknowledge our (Mohawk) right to exist as a nation? By what right did Canada think it could ignore parts of a treaty but take advantage of the rest? By what right did the Minister of Indian Affairs control every aspect of lives but was not the least bit accountable to us? By what right did Canada say it owned the very land beneath our Mohawk feet? Who gave it to them? And by what right? This preliminary study establishes that the Doctrine of Discovery has been institutionalized in law and policy, on national and international levels, and lies at the root of the violations of indigenous peoples’ human rights, both individual and collective. This has resulted in State claims to and the mass appropriation of the lands, territories and resources of indigenous peoples. Both the Doctrine of Discovery and a holistic structure that we term the Framework of Dominance have resulted in centuries of virtually unlimited resource extraction from the traditional territories of indigenous peoples. This, in turn, has resulted in the dispossession and impoverishment of indigenous peoples, and the host of problems that they face today on a daily basis. There are some who trace the roots of these exploitive and racist policies and laws back to the time of Classical Greece and Aristotle. However, the dots leading to this “Framework of Dominance” truly begin to connect with a string of papal decrees issued during the time of the Crusades. In 1095, Pope Urban II of the Roman Catholic Church called for the first Crusade to what is commonly called the Holy Land. The Crusades went on from the 11th through the 13th centuries. Their basic justification was that the “heathens and infidels,” (i.e., the non-Christian peoples) who held Jerusalem and the region surrounding it could be legally conquered and displaced by Christian European armies acting on orders of whatever pope happened to be in power at the time. It was also during this time, the writer asserts, that this series of papal decrees – papal bulls – began to coalesce into a legal framework that would eventually be called the “Doctrine of Discovery”. … four Euro-Christian states were established in the Holy Land region after the local rulers were defeated. From south to north they were the Kingdom of Jerusalem (roughly similar to today’s Israel), the Countship of Tripoli (covering some of what we know as Lebanon), the Principality of Antioch (in what is now northwestern Syria next to the Mediterranean) and the Countship of Edessa (incorporating an area of Turkey adjacent to today’s northern Syria). Thus, millions of acres of non-Christian lands in the Middle East were summarily taken over and governed by papally sanctioned European rulers because of the perceived and unquestioned “superior culture and superior religion” of the Christian Europeans. Over time, this culturally racist “justification” became a foundation of international law pertaining to lands inhabited by non-Christian peoples , because of (1), the power of the Pope and, (2), the large body of legal opinions and theories developing during the Crusades which helped legitimate taking lands and property from “infidel” peoples. By the time Columbus carried the Discovery Doctrine to the Western Hemisphere, it was four centuries old and had already been applied to African peoples by the Portuguese, to Baltic peoples by German knights, to the “wild Irish tribesmen” and the “savage” Scottish highlanders by the English, and to others. … by the authority of Almighty God conferred upon us in blessed Peter and of the vicarship of Jesus Christ, which we hold on earth, do by tenor of these presents, should any of said islands have been found by your envoys and captains, give, grant, and assign to you and your heirs and successors, kings of Castile and Leon, forever, together with all their dominions, cities, camps, places, and villages, and all rights, jurisdictions, and appurtenances, all islands and mainlands found and to be found, discovered and to be discovered towards the west and south, by drawing and establishing a line from the Arctic pole, namely the north, to the Antarctic pole, namely the south, no matter whether the said mainlands and islands are found and to be found in the direction of India or towards any other quarter, the said line to be distant one hundred leagues towards the west and south from any of the islands commonly known as the Azores and Cape Verde. With this proviso however that none of the islands and mainlands, found and to be found, discovered and to be discovered, beyond that said line towards the west and south, be in the actual possession of any Christian king or prince up to the birthday of our Lord Jesus Christ just past from which the present year one thousand four hundred and ninety-three begins. Translation: agents working for one Christian king could not claim lands and territories already claimed by another Christian king beyond an arbitrary line drawn down the middle of the Atlantic Ocean. This excluded the European mainland, of course, along with Portuguese and Spanish possessions off the east coast of Africa. Naturally, this left everything else in the world open for “discovery” and “conquest”– from the “New World” to Africa and Asia. This and other papal bulls also provided a basis for an international “Law of Nations”, outlining rules for international coexistence and colonial cooperation, and heralding the coming Ages of Colonialism and Imperialism. These passages specifically granted to nations and explorers cause to seek out lands unknown to Christians. In 1493 Pope Alexander VI issued Inter caetera stating one Christian nation did not have the right to establish dominion over lands previously dominated by another Christian nation, thus establishing the Law of Nations. Together, the Dum Diversas, the Romanus Pontifex and the Inter Caetera came to serve as a justification for the Discovery Doctrine and the Age of Imperialism. They were also early influences on the development of the slave trade of the 15th and 16th centuries, even though the papal bull Sublimus Dei of 1537 forbade the enslavement of non-Christians. That’s a polite version. In less polite language, the European papacy stacked the deck in favour of Christian kings in Europe at the expense of the world’s Indigneous peoples. The papal bulls were the foundation of a virtual world called the “Doctrine of Discovery”. The papacy and these Christian monarchs set the rules for themselves then made everyone else play by them. They didn’t tell anyone else what the game was about, the rules of game, or the cost of playing. They could change their rules as they saw fit. It was, in effect, a crooked game that brought huge riches to European monarchies, but resulted in cruel and brutal consequences for Indigenous peoples. It would continue for centuries, on through the Industrial Age and into today’s Information Age. Today, modern court decisions and government policies continue to be based upon this set of legal fallacies. The deck is still stacked, the game still fixed, and the rights of Indigenous peoples pre-determined even before they know it. This allows nations around the world to continue to deny fundamental justice to Indigenous peoples both in their own countries and on the international stages. The driving imperatives are – and always have been – a perceived need or want to access the resources that exist in or on the lands and territories of Indigenous populations. One need only read today’s headlines to see it.